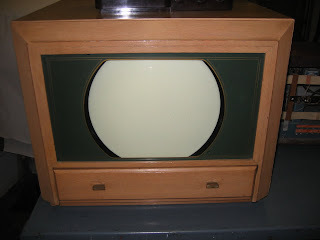 By now many of you have heard that the “Philo T. Farnsworth Television Museum,” recently of Auburn, closed and sold the majority of its over 700 piece collection of American popular culture and historical materials. Since 2003 the History Center has held discussions with the collection’s owner, a private citizen from Chicago, to acquire some of only a handful of historical artifacts actually related to Fort Wayne history. When requests to the collection’s owner for donations or pre-auction purchases were rejected, the History Center joined several hundred other private collectors and museums to vie for pieces from the liquidated collection. The auction was held on site at the World War II Victory Museum and also offered to the world through an online bidding option, which was the first time the History Center has participated in an online auction. 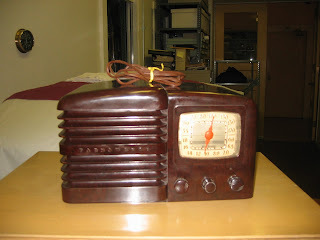 The History Center was successful in purchasing seven items from the collection’s auction, including the first television made by Magnavox in Fort Wayne (circa 1946-1947), a rare radio and phonograph combo unit and three other small radios all from the 1940s produced by the Farnsworth Radio and Television Corporation, and a nice collection of advertising and product materials from the 1930s to the 1950s related to Capehart, Farnsworth, and ITT. 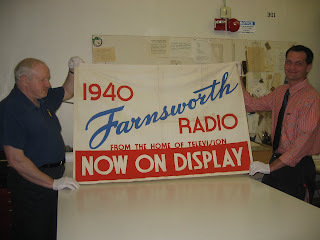 Perhaps the most intriguing purchase was a large advertising banner, dated 1940 and reading (in part) “Farnsworth Radio…from the home of television.” Support for these purchases came from the History Center’s Collections Fund and the Waterfield Foundation. Through this purchase the History Center looked to supplement its already extensive collection of historical materials related to Philo Farnsworth, the Capehart-Farnsworth Radio and Television Corporation, and other elements of 20th century television and radio production in Allen County. History Center members and partners should rest assured that the seven newly acquired artifacts will now be preserved and shared with our community for generations in a professional manner. 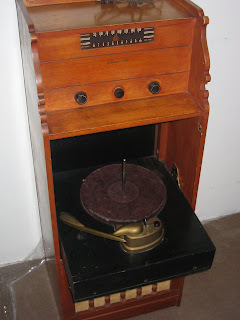 In fact, some of the purchased artifacts could be included in a new permanent exhibition gallery entitled “Made in Allen County,” which has long planned to feature the Philo Farnsworth story and is scheduled for unveiling in 2011. In the meantime, the newly acquired artifacts have been placed on display at the History Center and will be temporarily exhibited until November.